Elliott’s studio is situated in a small cabin behind his Helena, Montana home. Older field studies tilt against the wall along a ledge. Paintings, finished and aban- doned, stand on the floor and along the wainscoting for easy access. At the moment Elliott works only on this painting, giving it all his attention. Oil painter Josh Elliott sits in front of a huge canvas on his wheelie office chair. To his right a field study, much smaller and immediate, leans against the monitor where a photograph of Lake McDonald fills the screen. 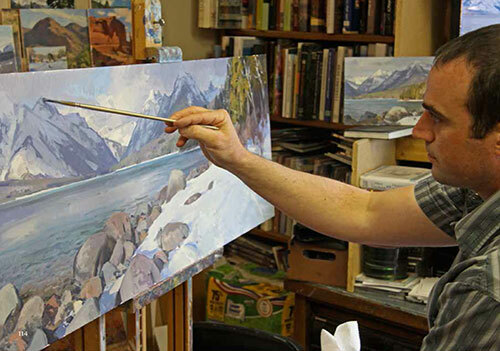 The panoramic scene of Glacier National Park’s larg- est lake spreads across the 18- by 54-inch painting. But it’s not just a rendition of the lake. It’s about the shadows and the light. The desolation and the almost invis ible evidence of wildlife. It’s about the rocks that traveled down the U-shaped valley and somehow landed on the opposite shore. Josh Elliott, Vermillion Kaleidoscope, Oil on Canvas, 24" x 48"
Elliott’s studio is situated in a small cabin behind his Helena, Montana home. Older field studies tilt against the wall along a ledge. Paintings, finished and abandoned, stand on the floor and along the wainscoting for easy access. At the moment Elliott works only on this painting, giving it all his attention. Elliott points out that if you’re on location for a week, there are only so many field studies that can be done in that amount of time. Whereas, the number of photographs you can take are almost infinite. From the speakers a mix of Indie rock cushions the one- room studio. Elliott dips his brush in the pool of color on his glass palette. “I have to follow my impulses and then decide later if it worked or not.” Holding the brush on the very end of the handle, as if to leverage the most amount of paint, he dabs at the mountain face, moving the easel with his foot, scooting it closer and then further away as he wheels this way and that, toward the palette and then back to the canvas. His brushstrokes are short, often with an eye bouncing from monitor to field study and back again. It’s this kind of almost intuitive knowledge of paint and style, of what he’s trying to do and what’s possible, that sets Elliott apart from his peers. 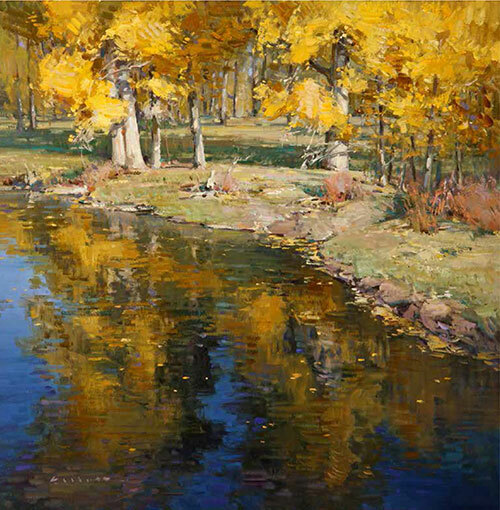 Mark Sublette, owner of the Medicine Man Gallery in Santa Fe, New Mexico, and Tucson, Arizona, represents Elliott and believes he has an uncanny ability to capture that unique sense of each landscape he tackles. Sublette has a deep respect for the places Elliott paints and so really recognizes the familiar ring of truth when he sees it. Elliott has been with the Medicine Man Gallery for the last seven years. Over that time Sublette has watched him get more and more successful. Elliott has been invited to many exclusive shows including the American Masters at Salmagundi Club in New York City, Maynard Dixon Country, Quest for the West at the Eiteljorg Museum, and Western Rendezvous of Art. He’s also seen a quickened maturity in his work. In February 2013, the Medicine Man Gallery in Tucson will show an exhibit of his work. Elliott tends to concentrate strictly on landscape painting. The painting of Lake McDonald is going to benefit Arts Without Boundaries, a non-profit that raises money to buy musical instruments and music lessons for kids who can’t afford to get their own. “It’s nice to be able to give back a little bit,” he says. plays with the light on the far mountainside, the cold snow banks, and the shadows cast by the valleys. Looking at the piece, the eye is constantly moving from one area to the next, circulating back around, but not taking the same path. It is this kind of understanding of composition that keeps the viewer engaged in a piece long after the first glance. Last year the Phoenix Art Museum had its inaugural presentation of The West Select, an exclusive, invitation-only sale and exhibition of work that reflects the West, not just Western artists. Jerry Smith is the curator of that show and its organizer as well as curator of the American and Western Art collection at the Phoenix Art Museum. Josh Elliott, Floating Gold, Oil on Canvas, 20" x 20"
Elliott includes small details that make a painting believable. As with all things well done, there is an apparent effortlessness in Elliott’s landscapes. Elliott is invited back again to the West Select. The sale is held on November 9th, but the show runs at the Phoenix Art Museum through December 31st. “I suspect he will continue to grow as an artist,” Smith says. “Josh creates atmosphere. The air quality, the moisure in the air or the dryness if it’s the Southwest ... he does those things so well. I’m looking forward to see where he goes in the future.